Storytelling through portraiture: A conversation with world-renowned photographer Mark Seliger. Many professional marketers initially think to tell brand stories through moving pictures, but portraiture can tell stories just as well. In order to tell the Edward Jones story with portraiture, we needed the help from the big-time photographer Mark Seliger. Mark was chief photographer for Rolling Stone from 1992 to 2002 and has shot covers for GQ and Vanity Fair. He recently took the Vanity Fair Oscar party photos which you can see on his Instagram. His portraits of celebrities are well-known and many are captured in his new book, Mark Seliger Photographs. For us, Mark captured the true smarts, strength, confidence and expertise of Edward Jones associates one beautiful image at a time. It was stunning to see him work and even better to get a chance to ask him a few questions about still-image storytelling. GD: “Storytelling” is a big buzzword in marketing, but most people associate that with moving pictures. Can portraiture tell stories? MS: Storytelling is an integral part to portraiture. A key element in approaching a portrait is knowing who you are photographing and then imagining what the portrait will look like. For instance, is it a simple deconstructed studio picture or an elaborate set? Are you portraying the best version of your subject or creating a character? Photography is just the paint brush. GD: How do you draw people out? How do you get them to reveal themselves and their story to the camera, so to speak? MS: Being in front of a camera is never an easy process for people. It is intimidating and with technology as it is today, the ability to see what you look like in a digital capture can eliminate the surprises you get from building a relationship in a session. To draw the person out or have them react takes creating an intimacy to help lower their guard. By that, I mean you have to know your subject and have them trust you. 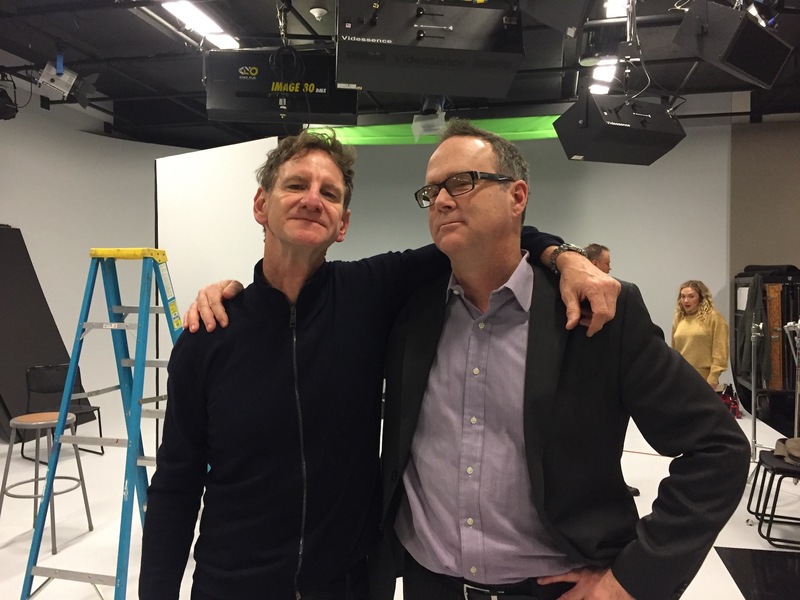 Above; Mark (left) and Gary (right) on set at the Edward Jones shoot. GD: You’re one of the top portrait photographers in the world. If someone is on the A-list, you’ve probably shot them – from Barack Obama to Bruce Springsteen to the Dalai Lama. Is the process of shooting an Edward Jones employee any different from shooting, say, Jennifer Lawrence? MS: The process is similar. You never want to have your subject feel that you are not in control, so a strong POV and empathy are key in the process. GD: What do you look for in a portrait? When do you know you’ve arrived at something great? MS: A memorable portrait is a balance of a good idea and a willing subject. When those two elements intersect, then it’s really up to me to connect those lines. GD: What do you love about photography? MS: I’ve always been passionate about photography and the mere fact that a photo can inspire and at the same time transport you into a story. However, it’s interpreted – that has always interested me. While film might be a great way to tell the brand’s story, it is not the only way. It was great to speak with Mark on how imagery like a portrait says so much. 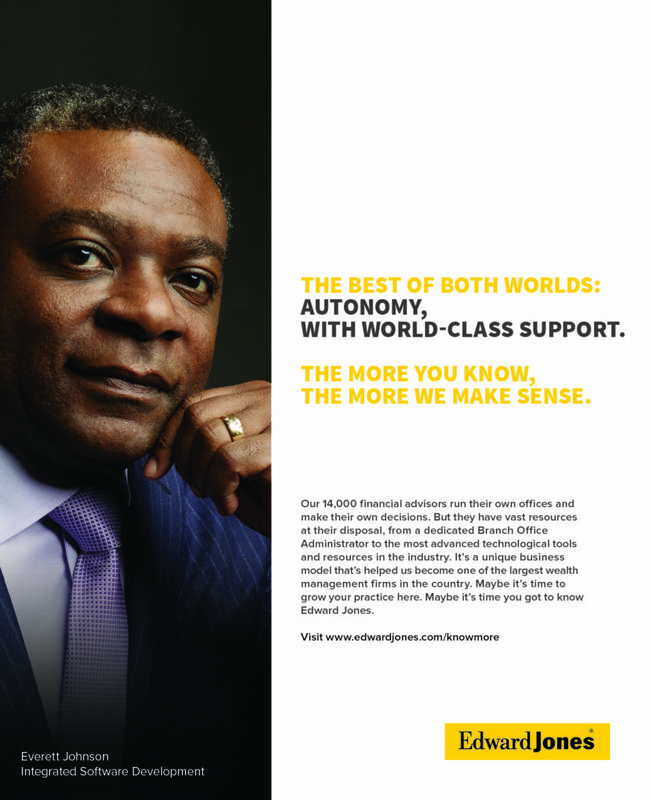 Here are a few results of our Edward Jones shoot with him. Enjoy!